In this episode Ray is joined once again by Dr. Richard Beck for a discussion of his “Slavery of Death” blog series which you can find at Richard’s blog, Experimental Theology. This is the second of a three part series surrounding the material covered in the “Slavery of Death” series. 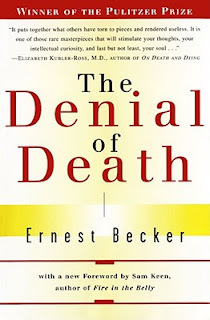 In this second part, Richard and Ray talk about the work of Ernest Becker in understanding how our culture tries to insulate itself from the fear of death. Could it be that our entire culture is constructed to distract us from and offer us meaning in the face of death? Make sure to join us for all three parts of this series and visit Experimental Theology where you will find the “Slavery of Death” series, and a lot more theological goodness! Check out Richards book Unclean for some great meditations on purity, hospitality, and mortality. Thanks Richard for taking the time to join us for these conversations! This such a great website. I followed Dr. Beck’s posts on his blog until I realized I had more reading to do to appreciate it more. I am a believer, but I have to admit that I wonder whether or not our own belief in Jesus, and all that entails, including going all the way back to the apostles. Even all religions themselves are really nothing more than articficial constructs. As much as we say we are not “this type” of Christian and seem more liberated from “bad” religion, why not just go the distance and accept that even God is a construct. If I were an atheist (well I admit that I don’t hold to a theistic view of God) I would still see the universe, life and everything (thanks Douglas Adams) as something “sacred” and meanigful in its, well, meaninglessness. The universe may not need us, as someone like Lawrence Krauss may suggest. If it doesn’t, so what? Why live with the conceit that we matter in the scope of things? I mean, does the universe need the Dodo bird, or any other species that is extinct? If not, why does it need us? If we are ultimately a mystery why continue to ask “why”? Why be ontological about anything? Just be in the moment with the wonderful relationships we have, create a world in which as many people can participate in that goodness, all under the banner of an awesome mystery? If a sunspot shoots out of the sun tomorrow and incinerates the earth’s atmosphere, and as we suffocate while we are being burned up, will we think what a great time we had, or just be aghast in silent terror or see Jesus in the clouds? Is there anything more precious than the nowness of the present moment and the other wonderful beings in my life? Aren’t the memories of loved ones enough and do we need “hope” to see them again? Why does it matter what will or won’t be in the uncertainty of anything other than our own demise? I am just seeing what everyone thinks. I praise Jesus everyday and grow to love him. I frankly cannot explain why I believe other than I was always taught to. Even if God doesn’t exist, would our lives really be emptier? I have to admit that that is what scares me. That all of the religion, God, Jesus, etc. isn’t real and that so much time, precious time, has been wasted. Is is true because I believe it, or do I believe it because it’s true? Matteo, I appreciate your honesty regarding your thoughts on the construct of God. What kind of bums me out is that even while you contemplate the many uncertainties surrounding human existence, you still have to pay your taxes. Thanks for your response. Please explain what you mean by paying your taxes. I’ve come to realize that pondering human existence is a futile endeavor. Can we replace that anxiety with awe? I think we can. In Buddhism there are what is refered to as the “14 unanswerable questions” which the Budda said were counterproductive areas of speculation which are essentially meaningless to relieving oneself and others from suffereing. The questions have to do with whether or not the universe is eternal, whether the world is finite or infinite, whether there is life after death. Basically, questions which Christians obsess about and great divides amongst one another. When I listen to atheists and theists debate, I have to admit that my initial question is “So what? Who cares?” Does any theology do anything to benefit us when Jesus shows us what we need to do in the here in now? All is theory and speculation to anaesthetize our fears of the unknown which really means God. We continue to fear God so we create barriers between him and us. That’s called religion. So, is that need really necessary? Are we willing to throw off these garments and stand before God naked and NOT be ashamed? According to my knowledge of scripture, Jesus was stripped down and hung a tree for all of us to see. He never gave me the impression that he was ashamed. Yet we are. The shame of Adam and Eve is our shame, but Jesus I think still tells us that we don’t need to be ashamed anymore. It’s done, over with…accomplished. We are part of the party now. Not even the fear of death should have any power over us. It should be experienced as a new part of the journey. Regarding pondering our existence, I think that this is an outcome of the “inner scientist” in some of us. We just want to know the origins. Is mainstream Christianity always the best place to start? For example, did Adam and Eve actually “fall” by eating a mango they were told not to pick, or was a fallen/broken humanity an outcome of having a helical arrangement of nucleic acid base pairs? If you observe any infant, they already display hints of this “human nature” long before they even understand the meaning of “sin”. I’ve really enjoyed the conversation between Richard and Ray as they unpack one potential aspect of the cause of human behavior. I especially like your comment “We are part of the party now. Not even the fear of death should have any power over us”. I guess this is the bottom line in the reality of the here and now. Please find two related references which give a completely different Illuminated Understanding of the meaning and significance of death. And which point out that a thorough and altogether whole-body Understanding of the meaning and significance of death is THE necessary key to true human maturity, and thus of the living of Right Life altogether. Until then there is always only a hell-deep fear-and-trembling, a fear which quite literally darkens every fraction and dimension of ones being and body-mind-complex. Well I have been listening toBTBP for 9 months. I am in the hospital on day 6 after quadruple heart by pass surgery. I just finished listening D of D…..l have had plenty to think about! My wife and I have been on journey for the past 5 years after leaving the institutional church, when it became an “unsafe place to disagree”.